Definition of Hypoglycemia – What is it? Hypoglycemia translated literally means 'low blood sugar'. Hypo in greek means 'low' and 'glycemia' means sugar or glucose. So if a person is described as “hypoglycemic” they are literally a person who has a low level of glucose in their blood. Given this definition therefore, one would assume that a hypoglycemic suffering with low blood sugar has a permanently low level of sugar in his or her blood all of the time. However this is not the case. Hypoglycemia can also be spelt hypoglycaemia in the English dictionary. Hypoglycaemia is Latin which is used as a universal naming language, normally via a genus & species. The exact translation is "under sweet blood". Hypoglycaemia has a number of distinguishing symptoms ranging from food cravings & tiredness to insomnia or depression. Many of the symptoms of hypoglycaemia can be resolved with a simple change of diet. Avoiding certain foods is paramount for people suffering from hypoglycaemia & in some cases this simple diet change could be the only treatment needed. The term 'Low Blood sugar' is misleading! The commonly used description of "hypoglycemia" as low blood sugar” is in fact misleading. Instead the most accurate term for describing the condition is in fact “unstable blood sugar” because a person suffering from 'low blood sugar' does not necessarily have to have a low level of sugar in their blood all the time to actually be "hypoglycemic". What does it mean to be Hypoglycemic? When one suffering from hypoglycemia eats their blood sugar level also begins to rise. However the pancreas of a sufferer for some reason overreacts and releases too much insulin. Due to the large amount of insulin that has been released, the blood sugar level of the sufferer falls to an uncomfortably low level bringing on an array of different symptoms such as tiredness, headaches, irritability, hunger and so on. Sugar and 'unhealthy' carbs are the cause of your misery! In an attempt to stop their blood sugar level from falling even more, the hypoglycemic reaches for a candy bar, or bag of potato chips in an attempt to rise their blood sugar to a more comfortable level. This however only brings temporary relief as the pancreas on sensing the rising blood sugar level overreacts once again beginning the whole traumatic experience for the sufferer. If you can relate to any of the above then it is likely that you could be suffering from Hypoglycemia. This condition if not corrected can cause misery for the sufferer who is often at a complete loss as to how to deal with it. However help is at hand! In the ebook Overcoming Hypoglycemia, you will learn how to stop the dreaded hypoglycemic vicious cycle once and for all. 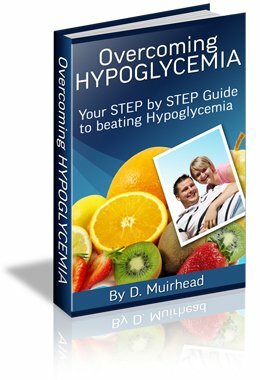 Overcoming Hypoglycemia is an Ebook of over 100 pages written by a sufferer of the condition who through years of trial and error and detailed research has managed to get his condition under control. The ebook is the only one of its kind that provides a detailed easy to follow step by step guide especially designed for sufferers of the condition to bring their symptoms under control.